Validation is performed by automated data checks or manual review. Each process can create results. Results are logged in a session in a workspace. Sessions define a series of validation and quality control transactions performed by data checks or manual review. Validation results are accessed through the Reviewer Results pane. You can inspect each result (or anomaly) to understand why it was logged by the validation process. A Reviewer workspace stores validation results in feature classes and tables. A project can contain only one connection to a Reviewer workspace. Once a connection to Reviewer results has been added in the project, another one cannot be added. To access the results in a session, you must first connect to a Reviewer workspace. On the Insert tab, in the Project group, click the Connections drop-down arrow and click Add Reviewer Results. 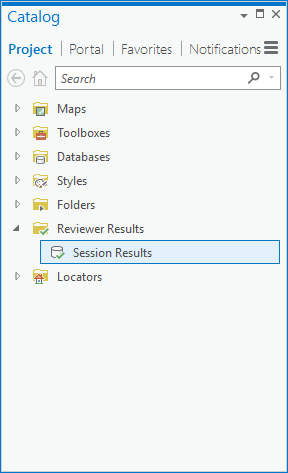 On the Select Reviewer Workspace dialog box, browse to the Reviewer workspace that contains Reviewer results. The Session Results node is added under Reviewer Results on the Catalog pane. To access results in a different Reviewer workspace, right-click Session Results on the Catalog pane, click Update Results Connection, and select a different Reviewer workspace. If a project references a Reviewer connection that cannot be accessed, the connection displays an alert icon on the Catalog pane. If the Reviewer connection is no longer necessary, right-click Session Results on the Catalog pane and click Remove Results Connection. To update the Reviewer connection to a valid Reviewer workspace, right-click Session Results on the Catalog pane and click Update Results Connection. Once you have established a Reviewer connection to your project, you can create a new session to execute a Reviewer batch job and store the validation results. In the Catalog pane, right-click Session Results and click New Session . In the Create Reviewer Session geoprocessing tool, type a name in the Session Name text box. Click the drop-down arrow to choose a session template. Click the Check For Duplicates drop-down arrow and choose an option. You can choose to check for duplicate records within this session only, the entire database, or not at all. Check the Do Not Store Geometry check box if you don't want to store the geometry along with the Reviewer results. In the Session User Name, keep the current Windows user login or provide a custom name to associate with this session. You now have a Reviewer session in your project that can be used to store validation results. Optionally, you can set the session as the default by right-clicking the session name and clicking Make Default . Your default session's properties will automatically populate in the Execute Reviewer Batch Job geoprocessing tool when running batch jobs. Once you have added a Reviewer connection to your project, you can add sessions to access the results in the Reviewer Results pane. On the Catalog pane, double-click Reviewer Results. Right-click Session Results and click Add Session. The Select Reviewer Session dialog box appears. Click one or more sessions on the Select Reviewer Session dialog box. The sessions are listed under the Session Results node in the Catalog pane. You can set one of your sessions in the project to be the default by right-clicking the session name and clicking Make Default. Your default session's properties will automatically populate in the Execute Reviewer Batch Job geoprocessing tool when running batch jobs. At some point in your workflow, typically after you have corrected and verified the results of a session, you may want to remove the session from your project. Removed sessions are still available from the Reviewer workspace and can be added back to the project if you want to review those session results again. To remove a session, expand Reviewer Results on the Catalog pane. Right-click the session you want to remove and click Remove . You can delete results when they are no longer needed or as specified by your organization's data management procedures. Deleting a session permanently deletes the session and all results associated with that session from your workspace, and also removes any reference to the session. To delete a session, expand Reviewer Results on the Catalog pane. Right-click the session you want to delete and click Delete . The Delete Reviewer Session geoprocessing tool opens with the Reviewer Workspace and Session parameter fields prepopulated. Click Run to permanently delete this session from the Reviewer workspace and remove its reference from your project. You will not be able to delete a session if it has been set as the default session. Once you have added one or more sessions to your project, you can view the results in those sessions by opening the Reviewer Results pane. On the Catalog pane, right-click Session Results and click Add Session. In the Select Reviewer Session dialog box, browse to your existing Reviewer sessions, select the session you want, and click Add. The Reviewer Results pane opens and displays results in a tabular format. When working with results for features in your map, double-click the row selector in the Reviewer Results pane to zoom to the geometry of the feature. When working with metadata results, double-click the row selector to display the metadata details in the Catalog pane. You can change the view of the Reviewer Results pane to display different result records. There are three different types of result records: feature, sampling, and metadata. You can restrict your view of results to one type or view all the results. By default, the results are displayed using All Results. This shows information such as the feature subtype and error details such as which check has been run and who ran it. More information can be found in Configure the Reviewer Results pane. Changing your view also changes the fields displayed in the Reviewer Results pane. In the Reviewer Results pane, click the Menu button . The columns displayed in the Reviewer Results pane change, depending on the option you choose.